I purchased a new roll marked Colt M1991A1 Government Model in December 2001. 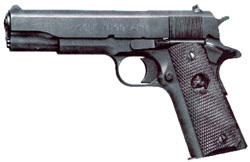 The rollmark on this gun reads “Colt’s Government Model .45 Automatic Caliber” and is not to be confused with the older “Colt M1991A1” rollmarks. This gun is a bit different than the older M1991A1 because of a stainless steel barrel, 3-dot sights, (supposedly) better workmanship, and of course the new rollmarks. I chose it over a Springfield loaded parkerized and Kimber Classic mostly because of the Colt name. And at $550, it was about $50 cheaper than the others. My first day shooting the pistol went very well. Two hundred rounds of 230gr. CCI Blazer FMJ through the gun with no malfunctions. The gun shot high at ranges under 30 feet (approximately 10 meters). This is a complaint that I have heard from several other owners of the new M1991A1. But the gun did shoot nice, tight groups – it was more accurate than I was. The 3-dot sights were easy to see and worked well. The factory trigger pull was, and continues to be, excellent – about a 5 pound pull. There is the typical slack (take-up) before the trigger meets resistance, and a little bit of creep before the hammer falls. But well done for a factory trigger. I would rate the fit and finish of the gun as good to excellent. The steel is blued and brushed on the slide flats, giving it a more refined finish than the old 1991’s all-matte look. An all-stainless steel barrel is standard. The slide to frame fit is good, but a slight rattling can be heard if the gun is shaken from side to side. I consider this normal. The feed ramp comes nicely polished from the factory. Moving parts like the slide, safety and mag release operate smoothly. The hard rubber grips are comfortable and flexible. A plastic trigger and mainspring housing are standard. A single seven-round magazine and trigger lock are included. There is no warranty on this gun, but an implied warranty in the owner’s manual basically states that if the gun breaks due to defects in manufacture, the broken parts will be replaced by Colt. I have since shot an additional 200 rounds of Winchester 185gr. FMJ through the gun, with no malfunctions. I am very satisfied with my new roll marked M1991A1 Government Model. I am going to replace the plastic trigger and mainspring housing and change the high-shooting 3-dot sights to some King’s fixed “hardball”, but no further modifications seem warranted. This gun is an excellent shooter and has provided the quality that I associate with the Colt name.